An important theme connects today’s Epistle and Gospel: All of the good things in our lives—even the ones we work very hard for ourselves—all of these good things come, ultimately, from God. And, since they do come, ultimately, from God, we have an obligation to share them cheerfully with our brethren in the Faith. Our gifts from God are different from person to person—Saint Paul enumerates only a few of them in his letter. This difference of talents is what makes the world function in a sort of “market” fashion. If we all possessed the same talents there would be no point in exchanging services, and many important things would go undone. At the smallest level, this sharing of talents is found in holy matrimony, where husband, wife, and children share the benefits of each other’s love and labor. 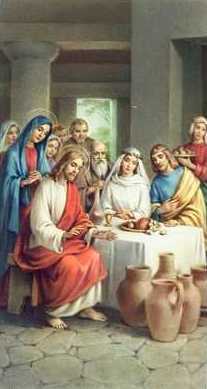 To my knowledge no one has ever written a story about what became of the bridal couple of Cana in Galilee. They were real people, but we can only speculate about what became of them and their newly founded family. Their wedding was witnessed by Jesus Christ Himself—I would suggest that His wedding present to them was far more than the six stone pots of water turned into wine. His present, I should think, was more along the lines of this ability to share each other’s labor and love. Of necessity, such a marriage would be blessed with many children, for the ability to share would be limited without them. Our bridal couple was also blessed by the intercession of the Blessed Virgin Mary. The Faith of this family would necessarily be strengthened by being first-hand witnesses to this miracle that she caused to take place. They knew that they had no more wine to serve, and they had no idea what to do about it. Mary intervened without being asked—certainly they could bring their future problems to her without fear of rejection—and anyone who could arrange to have water turned into wine would be a great problem solver to have one one’s side. It is not conjectural, though, to say that marriage is a Sacrament, and that from the time of Christ, forward, Christian men and women have conferred that Sacrament on each other through their consent to a lifelong union whose primary purpose is the procreation and education of children. It is not conjectural to say that society based on families united in Sacramental marriage is a stronger society than what might have existed before. Finally, we would be remiss if we failed to recall that the Blessed Virgin Mary looks after the needs of couples united in holy matrimony, just as she looked after the needs of the bridal couple at Cana. Those who are having difficulty in the married live ought to be confident in invoking her intercession with the Divine Author of Marriage. And, likewise, the citizens of a society are prudent when they implore the Blessed Virgin to look after the legitimate affairs of state. Here in these United States we invoke Our Lady under the title of the Immaculate Conception, who was chosen as the patroness of our Republic in 1792 by Archbishop John Carroll, the first bishop of Baltimore—a choice later confirmed by Pope Pius IX in 1847.